Explains the "whys" and the "hows"
Microsoft Office 2016 is more formidable than ever before. The importance of Office 2016 for Microsoft is growing. Fast. The remit of the business suite is not only sprawling quickly, it is also likely to be the only remaining legacy big revenue generator for the Redmond-based company as it embraces a freemium-ish model for Windows 10. We caught up with Richard Ellis, director for Office in the UK, to find out more about the next iteration(s) of Office. TechRadar Pro What is the difference between Office for Windows 10 and Office 2016? Richard Ellis With Office for Windows 10, we wanted to provide a touch and mobile-first experience across all PCs, tablets and mobile devices, including the expansion on new iOS and Android products. This meant that we were able to offer new versions of Word, Excel, PowerPoint, OneNote and Outlook which were designed from the ground up to run on Windows, built for touch. Office 2016 is the next version of our Office 'desktop' suite. As part of an always-up-to-date Office 365 subscription, Office 2016 will deliver the full Office toolset and is best for the desktop environment with a keyboard and mouse. Office 2016 will work on Windows 10 and selected earlier versions of Windows. We expect to make Office 2016 generally available the second half of 2015. The idea behind having two new versions of Office, Office for Windows tablet/phone and Office 2016, was to allow customers to choose the best way to get work done with Windows 10. They can either use the classic Office subscription that they know and trust, or use the new touch optimized Office applications to use on roaming devices to take work on the go. 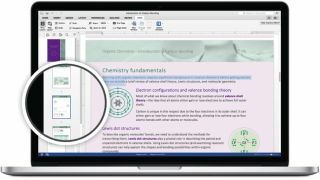 TRP Why did Microsoft release two versions of Office for Windows for touch, and how will they be different? RE The versions are built by the same team and offer similar functionality. We wanted to establish that both versions allowed customers to choose the best way to get work done with Office on Windows 10, whether it be on a phone or tablet device. Therefore we ensured that the interface complimented the dimensions of each device, and avoided any unnecessary difficulties for users. Generally the features are the same across the operating systems as well, whether it's Android, iOS or Windows. This provides the most complimentary Office experience for every customer, regardless of the device used. TRP Why is Office for Windows limited to four apps? RE We're committed to providing the best service and programs to customers, and with this we wanted to prioritise the apps which we believed would be the most essential to customers in their personal and professional lives. When the need for other apps is known to us by consumers, we will listen and make plans to develop further apps for Office for Windows. TRP What is the logic behind Office 365 Personal, and will it be replaced by Office for Windows? RE The idea behind Office 365 Personal is to allow one individual to connect one PC or Mac, one phone and one tablet to the service for $69.99 per year, allowing you to work across multiple devices thanks to the cloud. However, as it is designed to improve personal use of Office applications, it wouldn't accommodate for someone wishing to use programs for professional purposes. That is why Office for Windows offers further touch-optimised versions of Word, Excel, PowerPoint, OneNote and Outlook, so customers can work on-the-go with ease as well as allowing independent software vendors and developers to consistently extend and integrate with Office apps. TRP Will there be any desktop version of Office Online (perhaps as a replacement for Office 2010 Starter) and will Office 365 keep its name? RE Microsoft has nothing to share at the moment.